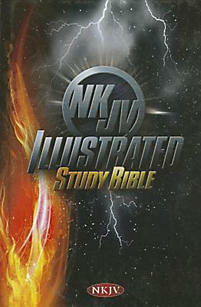 The popular NKJV Kllustrated Study Bible for Kids offers a fresh and exciting approach to Bible reading among children. It features the complete text of the popular NKJV translation plus dozens of full-color illustrations, maps, and reconstructions. Also included are easy-to-read study helps like The Ten Commandments for Kids, How to Have a Quiet Time, Test Your Bible Knowledge, and a Bible Dictionary for Kids. Other features include the words of Christ in red, plan of salvation, forty-four color pages, seven color maps, seven color biblical reconstructions, and various other parent-acclaimed topical helps. Available in unique designs for girls and boys!